(L to R): Christa Oechler, Hans-Peter Seum, Nenad Todorovic, Ulrich Schäfer, Leon Franz, Peter Franz, Diana Franz, and Christine Schulz. Photo credit: Maresch. 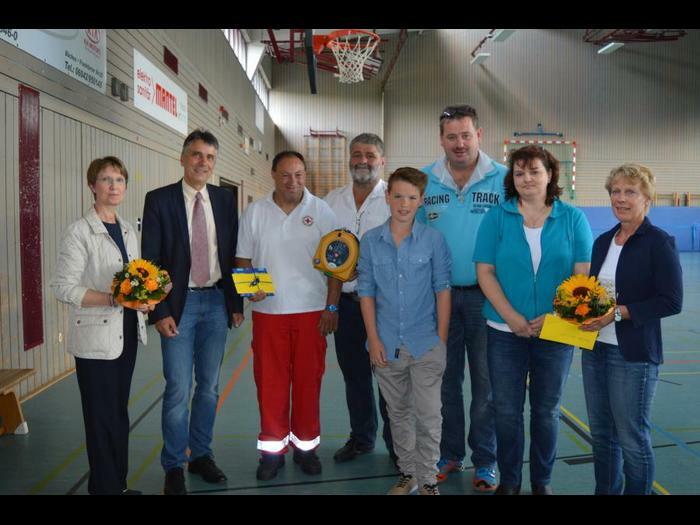 On November 13, 2014, Leon Franz from Ober-Lais in Germany suffered a Sudden Cardiac Arrest (SCA) while in Physical Education class. The twelve year old student suddenly collapsed as he went to tie his shoelaces. Immediately after, staff began cardiopulmonary resuscitation (CPR) and administered a shock by the nearby HeartSine Automated External Defibrillator (AED), which brought him back to life. Franz was then transported to a nearby hospital and has since fully recovered. Franz has donated a lifesaving HeartSine AED back to the school and its staff as a big thank you for their lifesaving efforts. His donation was courtesy of HeartSine’s Forward Hearts program, which allows survivors of a SCA event, in which a HeartSine defibrillator has been used, to potentially save another life by donating a HeartSine samaritan® PAD to the charity or organization of the survivor’s choice. With 84 percent of SCA events occurring outside of the healthcare setting, including on school grounds or school buses, or during sporting events, it is imperative to have an AED on hand in the event of a cardiac emergency. For our German speaking visitors, you can read the entire news feature by clicking here.